Everyone needs a dagger (I think). 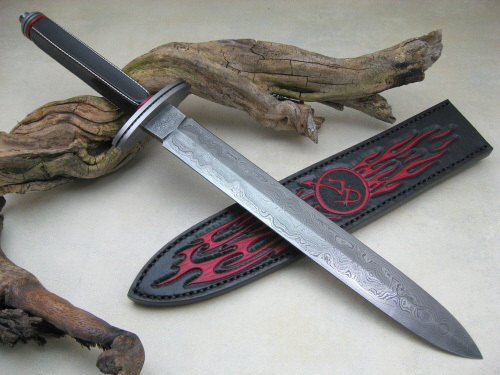 Swords & daggers are what first attracted me to knife making, there's just something magical about them. They're a part of every little boy's (or girl's) imagination from pirates to the round table. Below are a few examples of some of my favorites. Here is a new "Small Boot Dagger" I've designed with an hourglass shaped handle and integral double guard. The piece shown here is approx. 6" overall length (1/2 blade & 1/2 handle) and is forged from 1084 high carbon steel. The blade is differentially quenched and has a fine hand-rubbed finish. The handle scales are Tri-tone Green G-10 done in a "palm swell" style and are secured with 3 stainless steel pins.This style can work equally well with a Kydex or leather sheath with different carry options. These are Loveless-style NYC Daggers that I really enjoy making. 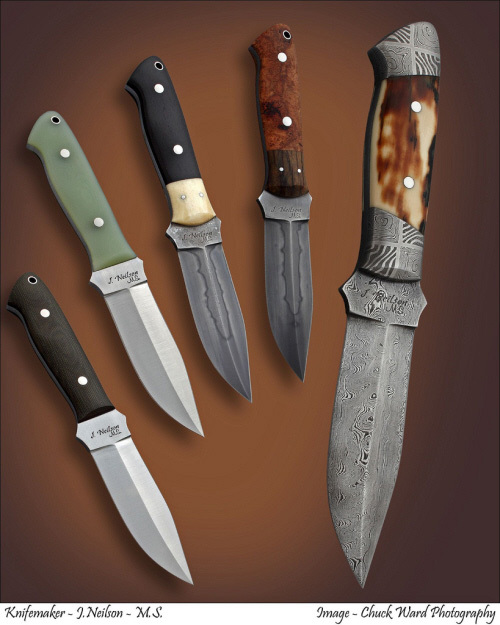 The "hunter-style" handle with the double grind "dagger" blade makes for a very handy tool. Since I've had a variety of requests for these in many forms, I've started making them regularly in three grades... the Basic User model is forged from W1 high carbon steel with a satin (belt) finish and Micarta or G-10 handle scales, bolts and a lanyard liner. Next is what I call my Standard model. This is forged from W2 high carbon steel with a hand rubbed/etched finish with premium wood handles and organic bolsters. My Premium model is forged from Damascus steel with Damascus bolsters as well as exhibition grade wood or ivory handle scales. The pieces shown have an overall length of 9 1/2" and a 4 1/4" (double) cutting edge. Here is the newest variation of my mini Neck/Push Dagger. This piece is 4" with the blade edge of 2 1/2", this small push dagger is the perfect size for neck carry. 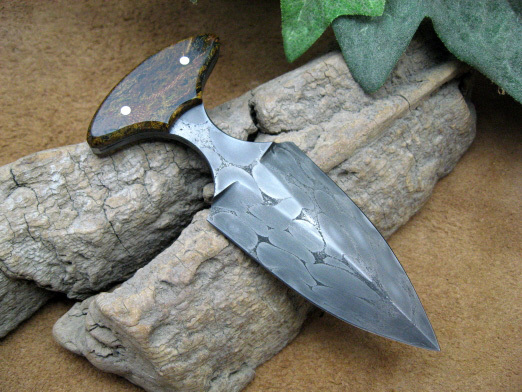 This chisel ground knife is forged "flat" from 52100HC ball-bearings & 1084HC powder steels. The handle scales are Original "Westinghouse" Micarta with stainless steel pins (logo is on the flat back of the blade). The knife comes with a molded Brown Kydex neck sheath with black rivets and ball-chain. 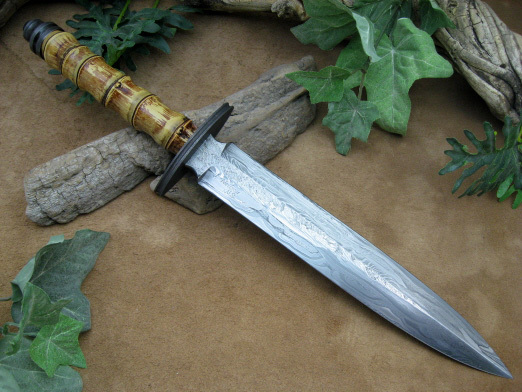 This Dagger has a 10" blade forged from high carbon "frontier" damascus (multiple damascus pattens/pieces done in a canister weld) with acid etched and forge marked flats on the ricasso and up the center line. The fullered oval guard and turned/fully threaded pommel have an antiqued/mustard finished 1018 carbon steel. The handle is lightly dyed Bamboo. 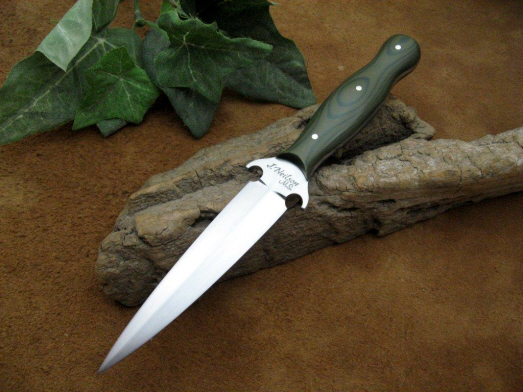 The overall length of this piece is 16 3/8" and comes with a tooled leather blade sheath. This Dagger has an 11 1/4" blade of 651 layer "bold & fine ladder" pattern damascus steel with a gentle tip and in-tapered ricasso. The ricasso sits on a nickle-silver oval ferrule. 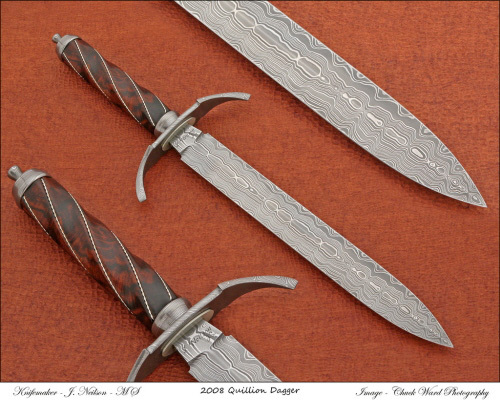 The curved/flared guard, end caps and finial are all 350 "twist" damascus steel. The 5-flute handle is done in A-grade Desert Ironwood Burl with .999 fine silver twisted wire set into the handle. This knife is a "take-down" style, measures approx 17 1/4" overall and comes with a classic leather sheath. This push-dagger has a 4" blade of hand-rubbed 1095 high carbon steel, with an overall length of 6 3/4". The handle scales are stabilized Buffalo horn with stainless steel pins. The horizontal carry leather sheath has a Stingray inlay. 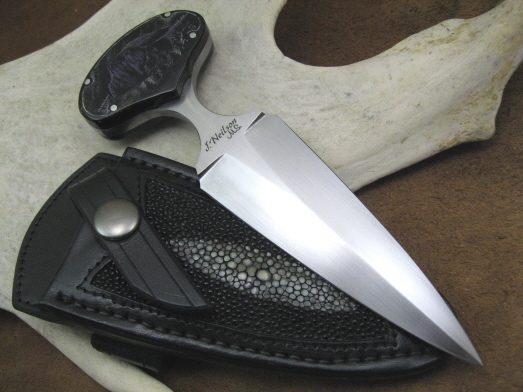 The knife is shown with scrimshaw work by Mark Schaukowitsch of "Denali Mountain"
This is another JD theme knife named after the woman who gave birth to the "Jersey Devil" in New Jersey folklore. The knife has a 10 3/4" blade made of a three-bar damascus construction. The three piece guard is made from "jailhouse" wrought iron and file worked/antiqued mild steel. The handle is stabilized and fluted Buffalo horn with red Micarta ends and .999 fine silver twisted inlays. The turned end cap and finial are also "jailhouse" wrought iron. The knife comes with a "Flamed" JD logo sheath.